Have Such Inhuman Arm Growths? Go DBZ On Bluto Like I Have! 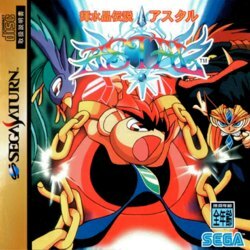 If jewels are a woman's best friend and if diamonds are forever, then someone at the Home Shopping Network should buy up every last copy of Astal, the little Sega platformer that could, for it is full of heart and priceless gemstones from head to toe. Of course, you can't plow your way through every adversary in the game and take your precious stones all the way to the bank, but some things are more important than money. 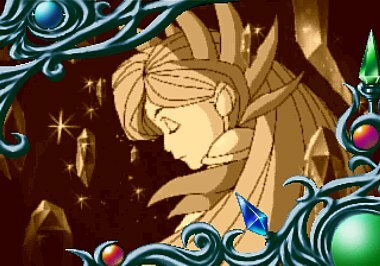 Astal holds a special place in most Saturn owners collection, for it is a simple game filled with beautiful landscapes and a tale of love and heroism. 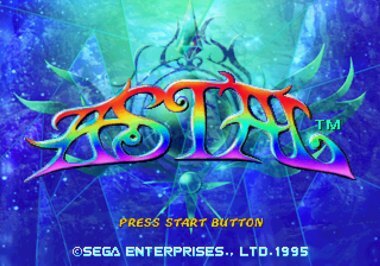 Many people know that Sega is indebted to its fans and owes them a lot of good sequels to great games like Streets of Rage, Ristar, Shenmue and others, but Astal is a game that tends to be forgotten on many a Sega fans wishlist. 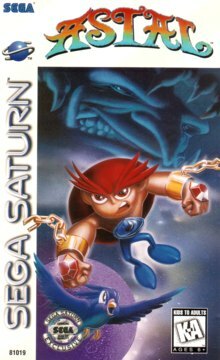 Sega Saturn needed some good 2D action/platformers and with Sonic mostly taking a backseat in the matter, it was up to someone else to fill his red and white kicks, and that is not an easy task. As such, Astal is capable of smoothing things over while Sonic is mostly absent from the scene. While Astal is a solid game, it achieves its greatness in very different ways from the historically significant blue wonder. Astal isn't about zipping through stages with impressive speed or grabbing a single ring to become an immortal, it's about vivid landscapes, a simple cast of characters, an enchanting soundtrack, a clear story and a hero with fists that rival Popeye the Sailorman. Let me describe these things in a little more detail. It all starts when a benevolent being, the goddess Antowas, decides to fashion a world of her own design called Quartilia. She creates many things, both big and small, entirely from jewels. However, what world is complete without "humans"? As such, Antowas makes her greatest creations, a boy by the name of Astal and a girl by the name of Leda. Leda is the bearer of life, and the world can take shape as long as Leda continues to provide for it. Astal is Leda's guardian, who protects Leda from harm with the incredible strength bestowed upon him by the goddess, making him far more powerful than any ordinary human. Together, it seems as though the two would have a wonderful future with one another and so the goddess sleeps...until Antowas' nemesis, Jerado, enters the fray. Bitter towards Antowas, jealous of her superior power and disgruntled by her love for all living things, he too creates a "human" named Geist, though his purpose is only to destroy. Geist attempts to kidnap Leda for a first time but Astal uses all of his power to rescue her. Sadly, due to Astal's short temper, he ravages the land in the process and causes so much commotion that he awakens Antowas from her slumber. Naturally, Antowas could not tolerate Astal's resolve on the matter and banishes Astal on Quartilia's moon. She then pursues Jerado and seals him away as well...but Antowas overlooked one minor detail...who was to stop Geist? Antowas was once again out of power and Geist still roams the land, eventually kidnapping Leda for a second time. Astal has about as much of this situation as he can stand and eventually breaks free to save her again. This is when Astal's real journey starts and when your game begins...but the world is not the same. Due to Antowas' absence and Leda's captivity, Jerado's power grows and the world of Quartalia becomes warped and filled with Jerado's twisted pawns. As you pound your way through this game, you will see the great attention to detail in the backdrops and dynamic presentation of this game. Sparkling rivers, dimly lit caverns, varying camera angles, highly detailed mythological beasts and more fill the screen. Each level is rich in color and the animation is swift and virtually seamless. I would have to say my least favorite level is the "Volcanic Valley", as it is a tad bit gaudy in comparison to the other levels, but the visuals as a whole do not pose a concern. Astal may not be as vivid and amazing as Rayman, but Rayman is almost in a league of its own. I like the slightly less colorful theme of Astal, personally. 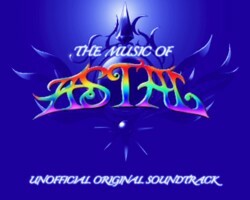 Next we have Astal's richly orchestrated soundtrack, which is a pleasure to listen to. North American gamers should thank people like Erik Wahlberg (the producer), Lori Von Rueden (the product manager) and Osamu Shibamiya (the translator), for this game may likely have not been released without their help. The tracks have a rich fantasy setting, with the opening theme being adventurous to the max. The game is also accompanied by occasional vocal segments where characters talk such as the intermissions between levels that let you know where Astal stands on his quest. 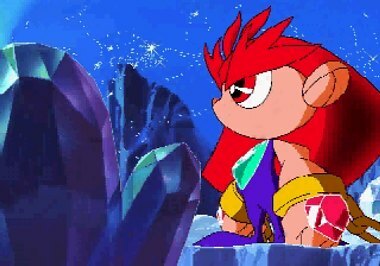 It is interesting however that Astal's sound effects have him screaming and yelling in what appears to be his Japanese voice, while major segments such as the dialogue were redone. This is not an uncommon practice if you've played your share of obscure games like Keio Flying Squadron, but it makes me wonder why they didn't just go the extra step to readjust the whole game. Finally, you have the gameplay, which does almost nothing new and is very rudimentary in design. Still, if someone can put up with Sonic doing mostly the same thing for nearly twenty years, I think we can all show some understanding for Astal. I'm not going to sit here and completely defend the games' linearity, but I can say that none of the things present in Astal obstruct the gameplay or bother you so much that you can't complete the game. This game is simple and to the point. 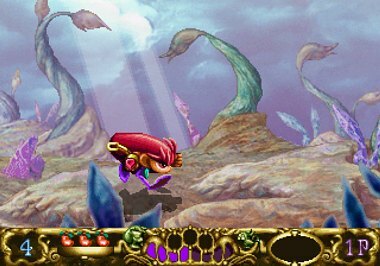 Astal can grab enemies, toss enemies, jump on enemies, stun enemies by pounding the ground, blow enemies away with great gusts of wind and even tear giant objects from the ground and hurl them across the screen. While all of these things are satisfactory, Astal can also do something else...interact with a pretty bird he quickly finds on the first level. This bird opens more possibilities in the things that Astal can do. 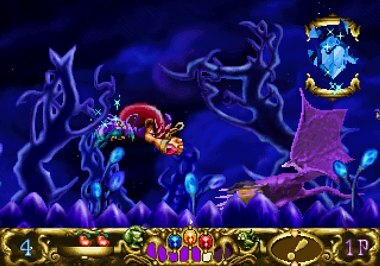 By issuing different commands, Astal can have the bird find healthy fruit for him to eat, grab one-ups and even attack all enemies on screen. Interestingly enough, the bird can even be controlled by a second controller, making Astal a two player game. You can even do a special combination attack if two people are playing the game, and Astal has all the versatility he needs at this point to become a compotent platforming hero. Different bosses have different strategies for defeating them as well as certain enemies, so rest assured knowing that you can't just run up on every foe you meet and grab them from the get-go. Astal has great visuals, great audio, and a simplistic gameplay engine that makes this game very easy to pick up and play. I am certain gamers looking for more complexity will dismiss this title as nothing more than a kids game, but currently being twenty-one years of age, I can say that I was thoroughly entertained by Astal. 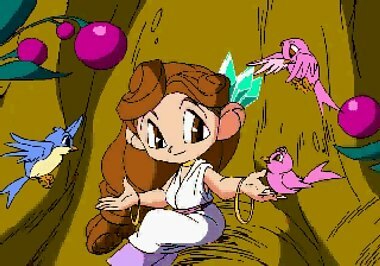 It's short, it's sweet, and there aren't too many rewarding platformers for Sega Saturn, especially in North America. While games like "Clockwork Knight" and "Bug!" are OK, Astal possesses a certain charm to me that most games for this system do not. This review has 52 extra images.